Editor's Note: Below is a brief excerpt from Market Edges (our weekly Macro newsletter of investable insights). Click here to learn more about Market Edges. 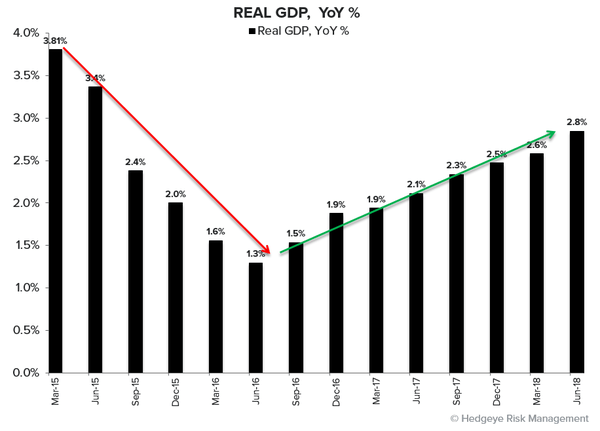 On Friday, 2Q 2018 U.S. GDP accelerated 20 basis points to 2.8% year-over-year. This marked the 8th straight quarter growth, the longest streak in U.S. history. "After the 8th consecutive (new record) year-over-year acceleration in U.S. GDP to 2.8% in 2Q 2018, some of your government guys are calling this “sustainable. Our preliminary headline now-casts for Q3 2018 is 2.34% and Q4 2018 is 1.68%, so it won’t appear to be sustainable if we are right. Growth, as a U.S. Style Factor, was down both relative and absolute last week too." In other words, the market has been pricing in a 2-year cycle high in US GDP growth, for … 2 years! As you can see in the chart below, this is the longest streak of U.S. #GrowthAccelerating in history. 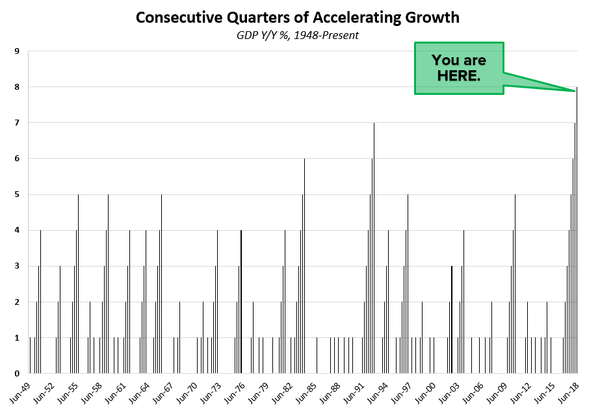 U.S. GDP has now accelerated (on a year-over-year basis) for eight straight quarters. Remember, it's the slope of the line that matters in macro. 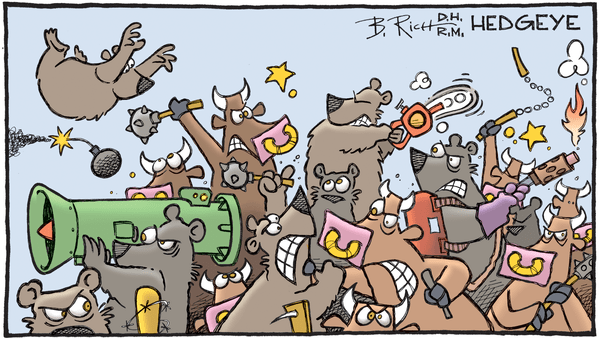 This is not where you start to get bullish on growth.